This design is free from the Classic Elite website. : A perfect lace beginner project! 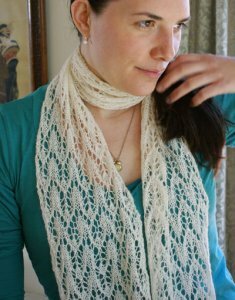 With the generous yardage of the Silky Alpaca Lace, you should have enough yardage to complete two scarves! Size US 7 straights are required but not included. Finished Size: approx. 7" wide and 70" long after blocking. Finished Gauge: 23 sts = 4". Color shown is #2416 French Vanilla.